Slice off the tops of the tomatoes and discard. Run the blade of a paring knife around the inner wall of the tomato, cutting the ribs away from the sides. Be careful to leave the walls of the tomato intact, otherwise you'll have a mess later on. Using a spoon, or melon baller, scoop out the pulp of the tomatoes. You may want to save this in the refrigerator for future use (a soup, maybe. or perhaps the beginnings of a pasta sauce). Once the tomatoes have been hollowed out into little bowls, place them on an oiled cookie sheet to await the stuffing. Heat a large skillet over medium-high heat, then add two tablespoons of the olive oil. Remove the sausage from its casing and add it to the pan. Brown the sausage well on all sides, breaking it up with a wooden spoon as it cooks. Stir every few minutes and cook for about 12-15 minutes until well browned. Using a slotted spoon remove the sausage from the pan, leaving the oil behind, and set the sausage aside in a large mixing bowl. Add another tablespoon of the olive oil, the onion, and the corn. Season well with salt and pepper and mix well in the pan. Saute onions and corn for 5-6 minutes, then add the garlic and cook 1 minute longer. Transfer the onion-corn-garlic mixture to the same bowl the sausage is in. Keeping the pan over the heat, pour the wine into the pan. Allow the wine to bubble and deglaze the pan for about 2 minutes, then pour it all into the bowl. Add the breadcrumbs and mint to the bowl and mix well. Stuff each tomato to about 1/2 inch above the rim and top with grated cheese. Bake for 25 minutes in your preheated oven. 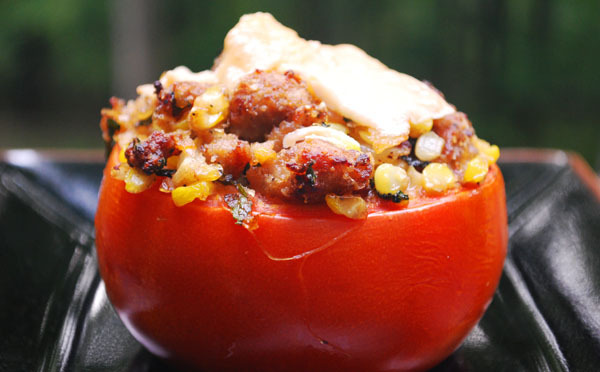 I would not have thought of stuffing tomatoes with sausage but I like the way your mind works. Particularly with the corn in there. Thanks, Dani. It's rare that I get a comment on the way my mind works... You made my day!